Marketing Ideas & Practice Management & Sales & Marketing for Professional Services & Strategic IssuesHow Big Is The Goldmine WITHIN An Advisers' Practice? Marketing Ideas & Quick Tips VideosBeing A Thought Leader Does Not Mean "Being First"
Here’s a simple strategy for getting paid fairly for the advice you give….and I mean getting paid for ALL the advice you give…every step of the way. Not enough financial advisers value themselves sufficiently to be confident of charging fee’s at the outset of a client engagement – yet that is how you should ensure that you can “eat”. When a client engages an adviser both parties should recognize that there is immense value in providing an objective assessment – a plan – for the client. The client is then free to do as they wish with that plan once it is delivered, however, value has been provided whether the client chooses to use the advice or not. Think of it in terms of seeking the professional expertise of an architect. The client engages the architect to assess their situation and the environment; the clients’ needs, desires and objectives; and try and balance all of those factors within the parameters of the clients’ resources. The result is a plan for the construction of a building for the client, and within the client’s budget. It may or may not actually ever get built….that is ultimately the client’s decision. The architect cannot really do anything about ensuring that the client follows the advice, or the plan. Nevertheless, the architect has used their time, expertise and skill to devise a suitable plan for the client. And the architect deserves to be paid fairly for that. The value of the professional does not, and should not be allowed to, hinge upon whether a client decides to use it. The value of anything purchased commercially should not depend on whether a consumer decides to use it or not. Imagine buying an expensive road bike and then being allowed to simply not pay the retailer because you hadn’t got around to getting on it and begin pedalling? Yet, Financial advisers do exactly this all the time. They offer an arrangement to clients whereby the client only has to pay for the expertise if the client decides to use it. Advisers frequently give away massive amounts of expertise for nothing (or next to nothing). They often don’t even seek to create some form of obligation on the part of the client to engage in any further work with the adviser after the initial plan is delivered. By not charging for time, skill and expertise when providing the Plan an adviser cannot “eat” reliably and regularly. 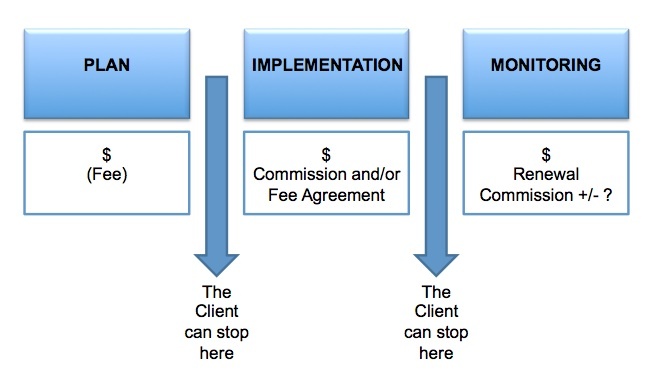 The second possible area of work that an adviser may be able to do for a client is the Implementation phase. And this is where many adviser work on commission, or a success fee, or variable project fee or anticipated AUM trail fees….this is where they “pray” that the work can be completed and they can get paid. Lastly, a financial adviser can be rewarded for an entirely different type of work on behalf of a client – that of providing ongoing service and support. Or “love“, if we tease out the whimsical theme. If you explain the three separate aspects of possible work and what is required for each of them, then each has its own clearly expressed value, and each phase can have its own charge. They can even be variable charging methods for different phases. Putting the three possible parts of a project alongside each other, together with how an adviser might get paid for each quite different piece of work, becomes a very simple way of explaining one’s remuneration basis for a particular scope of service. In explaining the possible range of work to a client it is important to highlight that the client has the option to disengage, or walk away, from any phase of the work. There is no obligation for a client to engage fully in all three areas of work that an adviser may provide….but that does not mean the adviser should not be paid for that particular work. Following the provision of a plan, should the client decide that they wish to engage the adviser to implement any recommendations that arise from it then it is effectively a new engagement. Some advisers will charge a fee for this aspect, but many more prefer to work on a success fee basis. For example, if a plan contained recommendations regarding income protection insurance then a client may ask the adviser to arrange that for them. The adviser then undertakes to complete the paperwork; compile the financial, employment and medical information on behalf of the client for the insurer; liaise with underwriters and chief medical officers; arrange payment and/or payment facilities; adviser the client upon the taxation implications of the cover; check policy schedules and documentation for accuracy; and anything else that may arise during the placement of the cover. Implementation can be a protracted business taking many many hours on the part of the adviser over a period of months. Once the cover is placed (for this example) the client has the choice of thanking the adviser and walking away. The adviser will have been paid for this work either on a contingency fee basis, or a commission basis, or a blend of the two. But getting the recommended actions put in place on behalf of the client involves a strong element of “praying” by the adviser….it is usually not a guaranteed success. Finally, the client may wish to have the adviser provide ongoing service and support. The adviser does in effect promise to “love” the client account from that moment forth, in sickness and in health, until the two shall part…..at a price. That price may be determined as asset-based fees, trail commission, agreed service fees, or a flat annual fee each year….but the “love” comes at a price, which the client can choose to pay for, or not engage in. Accurately positioning the different projects that an adviser MIGHT undertake for a client, whilst providing the client with full choice regarding what the adviser does for them, is excellent business. It also ensures that each possible type of engagement attracts fair pay for the work being done at that point. The model of “eat; pray; love” ensures maximum client choice in the scope of service whilst ensuring that advisers do not live on hope, or prayer, alone. Written Advice: Should it be Clear? Concise? or, Effective? Good one, Tony. Your post was much more interesting than the movie! Thanks Tony, you have just reaffirmed what I have just put into practice, but in a more clear & succinct manner!